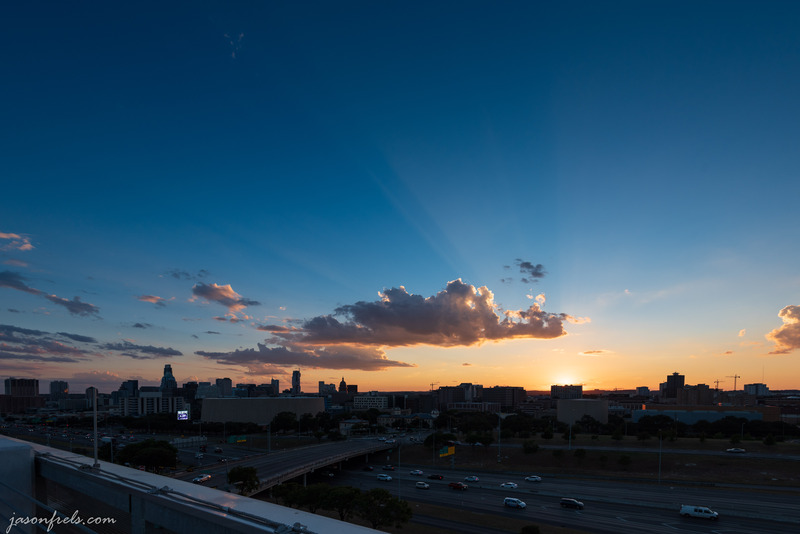 I have been scouting locations for a photograph idea that I have involving the Austin skyline. 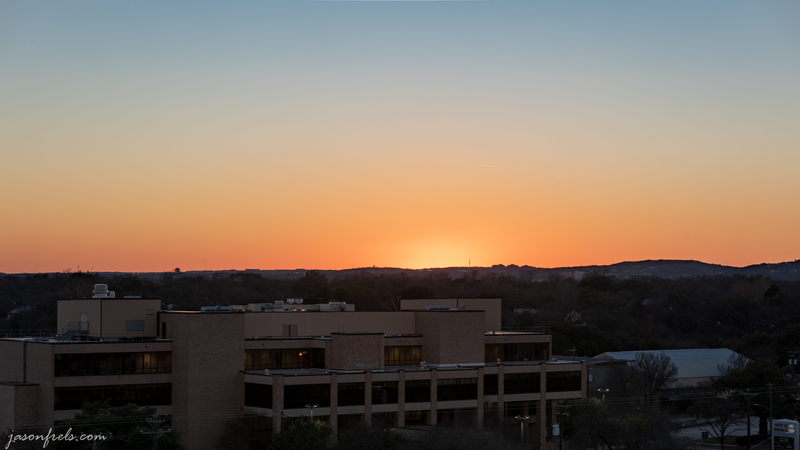 My idea basically calls for a panorama of a mostly silhouetted downtown against a nice sunset cloud show. This idea has two major challenges. Finding a good location from which to shoot. Being on location during a nice sunset. The sun sets every evening, but a beautiful sunset is rare. It’s either too cloudy or not cloudy enough. Or the clouds are too low and don’t catch light or are bunched on the horizon and block the sun. I have managed very few exceptional sunsets. The one below was mostly luck, being on a high balcony on a good evening. So, all I can do about this is watch the sky and keep trying. As for location, I have tried a few places with mixed results. I have tried a parking garage at the University of Texas baseball stadium which provides an elevated view to the west. This location kind of has an ugly foreground that is difficult to shoot around – Interstate 35. It is also not fun to work through traffic to get to this place. but I can get a full sunset from up here. I have also tried a different parking structure a bit farther north of the baseball stadium (see image below) a couple of times and have found that I don’t like the hospital and football stadium in the foreground. I don’t think I will get what I want from this location. Last night I scouted a new location at a parking garage north of downtown. This puts the southern sky behind downtown, but with a good sunset I should still be able to get some colorful clouds. This location gives me a mostly unobstructed view of downtown from a distance. 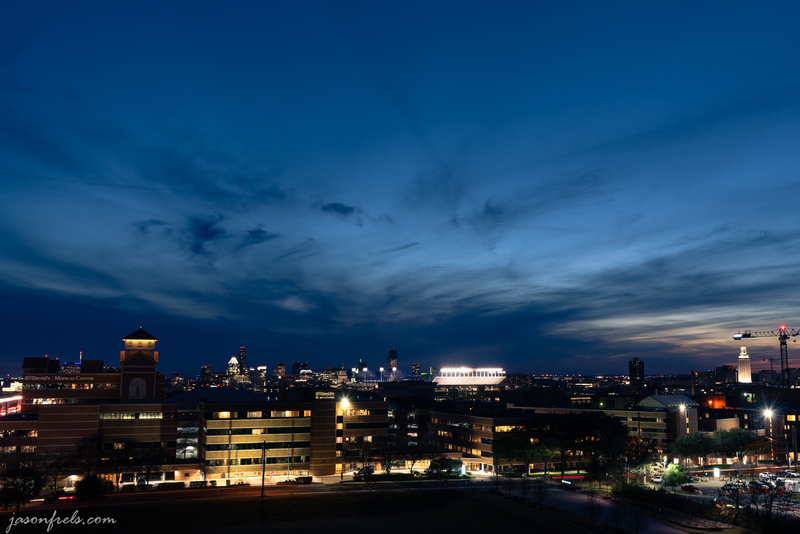 The sky was clear last night, but I did take this scouting panorama of downtown from the new location. This is a merge of multiple images shot at 200mm focal length. I did get some setting sun glinting off a few of the buildings. This was a test shot for evaluating later. I did make a mistake in shooting these photos. I didn’t keep a constant exposure and you can see to the right of the image that there is a slightly darker frame. 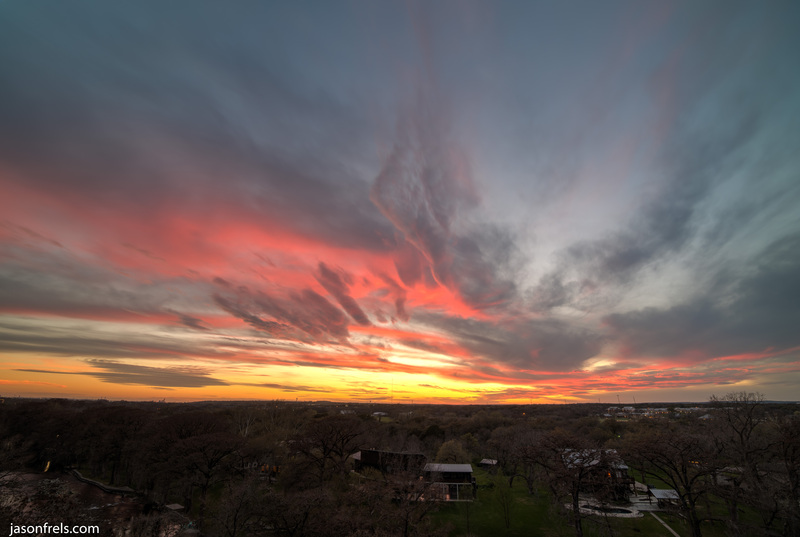 I have to remember to shoot in manual mode for panoramas. I did use a tripod with a remote shutter release and I used mirror lock-up to minimize vibrations. In practice, I would zoom back a little and try to get more of the sky in the shot with a good sunset. I don’t love the ever-present construction cranes in the shot, but what is there to do (Photoshop, I guess). I am not sure if I would prefer a totally silhouetted downtown or some detail in the architecture. Also, from this location, the capitol is hidden among some other buildings and will not stand out in a silhouette (see the far left of the panorama). I also did an HDR of the horizon just after sunset. Not all that impressive, just orange. I would have stayed around for some blue hour photos, but I had just consumed a large container of coffee and was starting to get very uncomfortable, so I had to leave. Overall, I am not sure that this location will provide what I am looking for. I will watch the clouds and perhaps try this. It is not nearly as difficult to get to as the baseball stadium, but I am afraid that I will be shooting in too much the wrong direction.